In an attempt to adjust to running in the warmer temperatures, I started my run a little after 8 am this morning. I had 12 miles planned. After 3.5 miles, I decided to head home and finish on Millie. About a mile from my house, there is a bank with one of those signs that tells the time and temperature. It was a little after 9 am and already 90 degrees. The heat just zaps all the energy from my body. And there wasn't a cloud in the sky and hardly a hint of a breeze to give me some relief. I think I may have even been borderline delirious most of the run because I didn't really think about anything but just kept hearing the song Call Me Maybe in my head over and over. And I wasn't listening to music. I would rather run all day in a blizzard than one hour in 90+ degree temperatures. I called my hubs when I got home and told him I might just lie down on the side of the road and give up during the St. George Marathon (in October) if it is hot again this year. Since most of you aren't pathetic wusses when it comes to running in the heat, I decided to share this article, which has a lot of info that you might already know but also has some great reminders and info that might be useful when running in the rising temps. As the temperature rises, the risk of heat illness increases. During exercise, a significant amount of heat is generated. In cool weather, this generated heat is transferred to the air. In hot weather, this transfer of heat is inhibited, causing a greater increase in the body temperature. Sweating occurs to help regulate body temperature; the evaporation of sweat from the skin results in dissipation of heat. As the humidity rises, there is a decreased rate of evaporation of sweat, diminishing the cooling effect. Exercising in the heat places a great stress on the body. Performance is decreased; heart rate is increased compared to the same level of activity at a cooler temperature. The risks of dehydration and heat illness increase as the temperature and humidity increase. The body will adapt to repeated episodes of exercise in the heat to reduce the impact of heat on performance and the risk of heat illness (the risk of dehydration is not reduced). With acclimatization, the amount of fluid circulating in the body is increased to meet the demands of exercising muscles. Sweating will occur earlier in the course of exercise and at a lower core temperature. The rate of sweat production is increased and the sodium content of the sweat is decreased. These adaptations will occur over a 7 to 15 day period and will persist for up to 3 weeks after leaving a hot environment. No one is immune to the risk of heat illness, but the risk is greater in those who are out of shape, overweight, dehydrated, ill, taking certain medications or supplements, or are not acclimatized to the heat. Wearing excessive clothing (i.e. tights) or a helmet and padding decreases the body’s ability to dissipate heat resulting in an increase in core temperature. Heat illness from exertion is a spectrum of disorders ranging from heat cramps to heat stroke. Dehydration is a major factor in each of these disorders; dehydration negatively impacts the body’s ability to dissipate heat and athletic performance. Symptoms of dehydration may include thirst, irritability, dizziness, nausea, vomiting, cramps, chills, weakness and fatigue. Checking weight prior to and following exercise provides guidelines for assessing the degree of dehydration; each pound that was lost represents a 16 ounce fluid deficit that needs to be replaced. The exact cause of muscle cramps is not truly known, but cramping tends to occur later in activity, in association with fatigue and dehydration. Athletes who lose a lot of salt in their sweat (white crust on clothing and skin) often experience muscle cramps. Gentle stretching and massage may help reduce pain from cramping. Lost fluids and salt must be replaced in the diet. As a result of strenuous activity in the heat, the body may not be able to deal with the increasing demands on the cardiac and circulatory systems, causing heat exhaustion. Symptoms may include severe fatigue, dizziness, fainting, chills or goose bumps, dehydration, headache, nausea, vomiting, diarrhea and stomach or muscle cramps. The core (rectal) temperature is elevated, but typically less than 104o F (40oC). The athlete should be removed from the heat and cooled off. Lay him/her with the legs elevated. Ice packs on the groin, armpits and neck may be used for cooling. Have the athlete drink cool water or sports drink. If disorientation develops, vomiting prevents rehydration or any symptoms worsen, the athlete should be transported to the emergency room. The athlete should be evaluated by a physician prior to return to exercise following an episode of heat exhaustion. A gradual return to full activity and intensity is recommended. Heat stroke due to exertion is the result of the breakdown of the thermoregulatory system; this causes severe stress on the circulatory, metabolic and nervous systems. The body temperature rises to extreme levels, causing cell and tissue damage and could result in death. This is a medical emergency. The core (rectal) temperature is usually greater than 104oF (40oC); temperatures taken in the ear, armpit or orally do not adequately reflect the body temperature. The athlete has mental status changes; he/she may be unconscious, irritable, convulsing, confused or disoriented. Typically the athlete is sweating in the case of exertional heat stroke. Any of the symptoms listed for heat exhaustion may also be present. The most important part of treatment is to start cooling the athlete immediately as an ambulance is called. Place ice on the neck, groin and armpits, spray with cold water or immerse in a tub of cold water. Monitor the breathing, pulse and temperature closely. Stop the cooling when the core temperature reaches 101o F. The athlete should be transported to the emergency room. The risk of heat illness can be decreased by slowly increasing activities in the hot weather. Checking your weight prior to and following exercise allows rehydration prior to the next workout. Add salt to your food while exercising in the heat. Limit exercise if you are sick. Stay away from supplements containing stimulants. The risk of heat illness is increased by medications such as certain antidepressants, anticholinergics, antihistamines, diuretics, and beta blockers; use of alcohol and many abused drugs; sleep deprivation; certain chronic medical conditions and obesity. 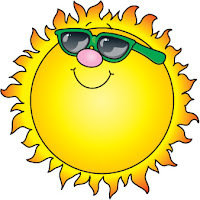 Children and the elderly are at increased risk of heat illness. Be smart and stay safe. 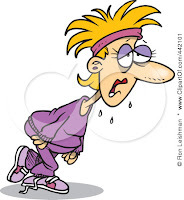 Don’t tough it out if you start to feel ill; early treatment of heat illness will prevent a potentially fatal outcome. Dr. Fieseler is the Director of Sports Medicine for the Trinity Mother Frances Health System in Tyler, TX. 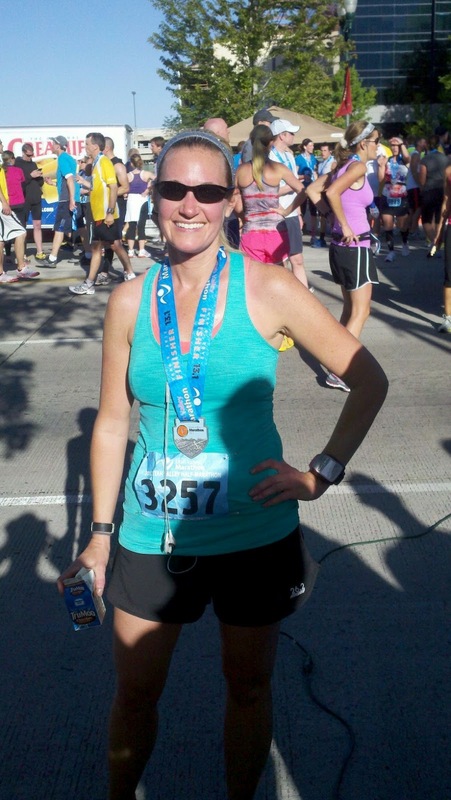 She is a regular contributor to Running Times and has served as the chairperson for the sports medicine committee of the Road Runners Club of America. For more information on Dr. Fieseler’s medical services, click on Dr. Cathy Fieseler. © 2012 Savvy Runner Inc.
“Bennett Cohen (The Savvy Runner) and Gail Gould are the Founders and Presidents of the International Association of Women Runners. To learn more about this global community of women runners, visit www.iawr-connect.com. It's time for some accountability. I can run until my legs fall off, but I'm not going to lose the weight that has been weighing on me for far too long (I'm hilarious) or get the tone abs I've been trying to sculpt for even longer if I keep fueling with Krispy Kremes (guilty of that offense this morning) and following my bowl of pears and cottage cheese with two snickerdoodles. Something has to give, and I'm determined it won't be the scale giving me yet another pound or two. So it's time to start keeping track of what I eat (again) and get back to making smarter choices and less excuses. Trust me; I'm a pro at giving myself a list of excuses and justifications for eating a custard-filled, chocolate-covered doughnut for breakfast. Obviously it's not in the picture because it's in my belly. So, if you feel like following me and making me a llittle more accountable, my username at MyFitnessPal is ihaverun. The accountability starts tomorrow. I can't bear to see the number of calories I have already consumed today. Maybe after my run. But probably not. Vega sent me some Energizing Smoothies to try. 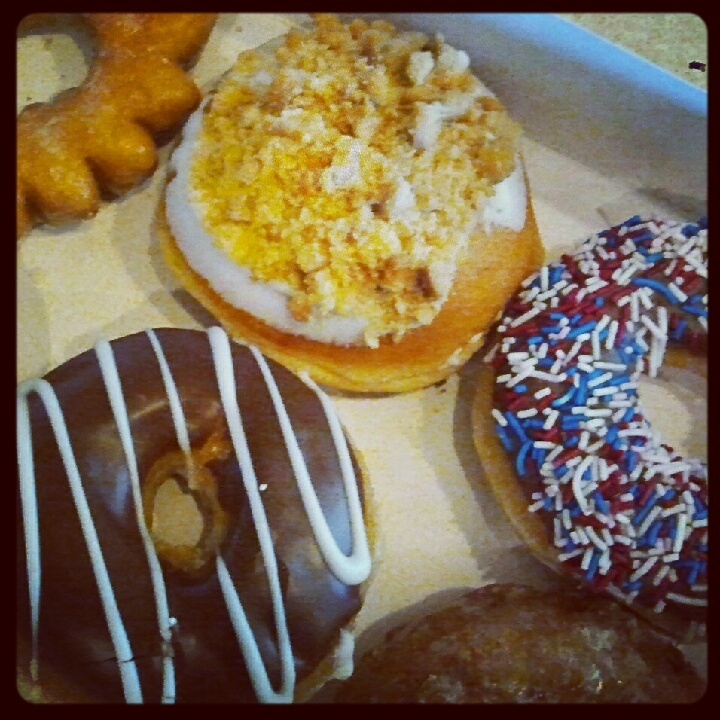 I LOVED the vanilla almondilla. It was a hands-down favorite! The chocolate was good too. But I wasn't in love with the tropical tango or berry. That's not a surprise though, because I'm more of a chocolate and vanilla kind of girl when it comes to things like milkshakes too. There is also a natural flavor, which is great added to a fruit or green smoothie. I mixed all the different flavors with almond coconut milk. It is my new favorite thing and has made me a smoothie freak (until my hand blender died earlier this week - cue very, very sad music). So once my hand blender is back in business, I'll be back to downing smoothies again. Until then, I'll just try to stop after the pears and cottage cheese. If you have any other great snack suggestions, please share! I can always use some new additions to the line up. I'm exhausted. Who knew summer could be busier and crazier than the school year? Between baseball games, swimming lessons, summer camp, work and making the most of it being "summer," I feel like I never slow down. My blog neglect is proof of the craziness that is my life right now. However, life is never too busy to run. It's all about priorities. And MAKING the time. Making the time was a little easier this week because my girls had summer camp from 10 am - 2 pm, which meant I had the chance to run outside three days this week. Starting at 10 am meant warmer temps though, so I checked the weather and decided Wednesday would be one of the better days to tackle my longer run. So yesterday I headed out for 10 miles after I dropped the girls off. It was a little warm, but not too bad. 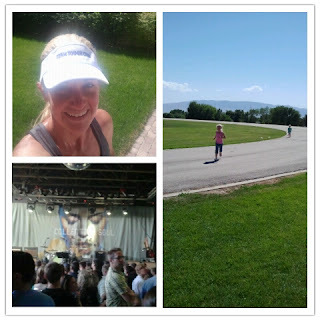 My legs were a little tired from the five hilly miles I ran on Tuesday, and the rest of me was very tired from staying up way too late (but totally worth it) at the Collective Soul concert. The picture below was before the concert. All the "during" pics are on my hubby's phone. The concert was in was a small club-like venue. It was awesome to be close to the band, which is really amazing live! With my long run done, I debated hitting the treadmill for today's scheduled four miles, but I decided to tackle the warmer temperatures. I told myself it was making me mentally stronger in case the St. George Marathon is hot again this year. I'm trying to learn to love that little voice in my head. On my head, I wore a visor (my Team Tough Chik visor!) for the first time. It was great for keeping the sun out of my eyes and didn't move. It got pretty sweaty though, which made me and my sensitive skin a little worried about breaking out all along my forehead, which would be so awesome! So I will probably only wear it every other run or so. And only after it has been washed! I'm not sure why it's glowing in the picture. And last but not least, I tackled a run at the track for the first time last week. Not far from my house, there is a track with a playground next to it. The girls played while I logged a few miles. I didn't plan a certain distance, but instead let my girls decide when we would be done. I wasn't sure how long they would last because it was late afternoon and pretty hot! Toward the end of two miles, they headed over and started running around the track too. They were both wearing flip flops, but that didn't slow them down. I'm thinking about tackling my speedwork at the track next week, but I think we'll head over a little earlier in the day this time. What are you loving on this first official Thursday of the summer? 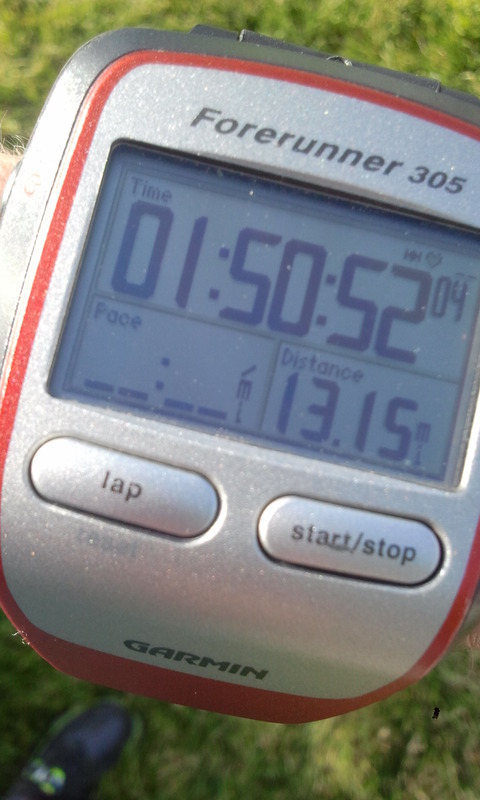 Saturday I ran my 12th half marathon. After the race, someone asked how many I have run. I told them I thought this was around the eighth, so I was a little surprised when I went home and counted. The Utah Valley Half was not only my 12th half marathon, but it was my third time running this race. I love the course and was excited to see my progress over the past year. I have been a lot more focused in my training, and I was hoping for a PR, although I thought it might be a little tough since my PR was set on a more downhill course. My previous best time for Utah Valley was 1:56:09 and my half marathon PR was 1:52:39. I wasn't sure I could cut almost four minutes off my time for that course to get in under 1:52:39. About halfway, I realized a PR might be possible. I only looked at my watch three or four times the whole race, and just to check my pace when I felt like I was slowing down. But even those times, I was always at an 8:30 or faster pace. I finally looked at my time as I hit the last mile and knew I could get it. The last mile was tough, but I finished strong, with a chip time of 1:50:52. Exactly the same as my Garmin! One of the highlights of the race was seeing my little family just before I crossed the finish line. Knowing they would be there is what pushed me through the last mile. The temperature couldn't have been better for this race. After a crazy windy day on Friday (and serious wind later in the day on Saturday! ), there was just a breeze off and on during the race; it was just enough to cool me off but not enough to slow me down. I finished feeling great, I didn't get dehydrated, and I had no stomach issues during or after the race. And I wasn't too sore they next day and only really felt it when I went down stairs or when my girls would jab me in my quads, which they oddly do quite often. I couldn't have asked for a better race! After downing some chocolate milk and some water to get a little rehydrated, I headed home and showered off the coating of salt on my body. Then I headed back to meet up with Julia (who rocked her little 26.2 training run - in preparation for her 50 miler coming up) and Rachelle (who got another BQ and a PR). I also saw Alicia, who wasn't able to run because of an injury but who came to cheer on her friends like the awesome runnerd and person she is. And last but not least, I met up with Farrah and her little girl so we could run the kids 1K all together. How or why do you run? 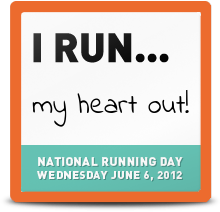 Share in comment; then get your own badge to celebrate National Running Day (today!) at http://www.runningday.org/. 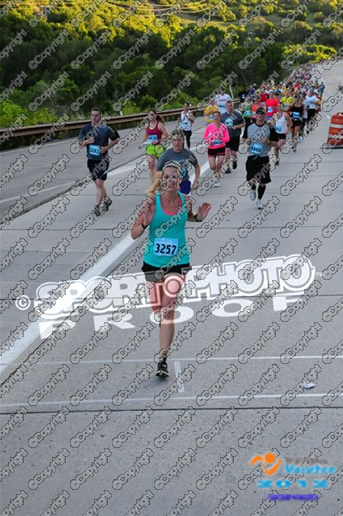 Happy National Running Day my fellow runnerds! !